Used As PEDT Polymerization Dopant, And Also Take Part In Many Organic Syntheses. 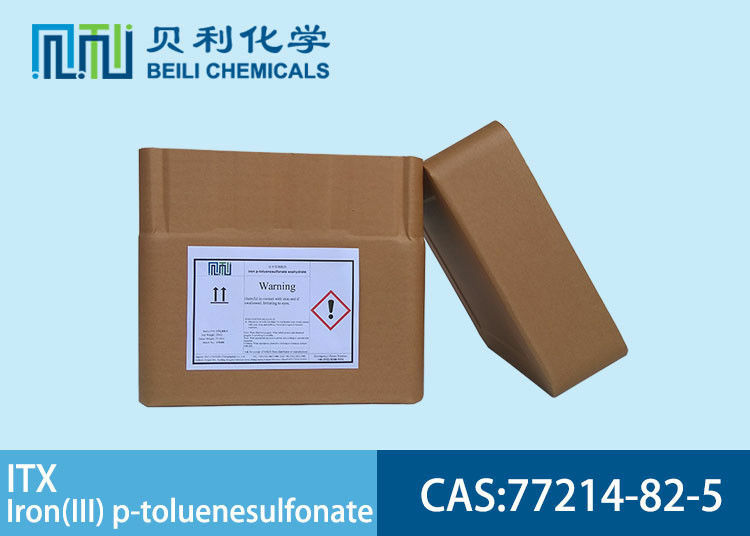 ITX / benzenesulfonic acid 77214-82-5 , also known as Iron(III) p-toluenesulfonate hexahydrate, its appearance was orange to brown powder. Iron(III) p-toluenesulfonate and EDOT are polymerized in proportion to the production of solid capacitors. ITX / benzenesulfonic acid 77214-82-5 is used in solid-state capacitors, as oxidant; Mixed with Heterocyclic monomer, for example Ethylenedioxythiophene(EDOT), then using organic solvent such as isopropyl alcohol, methanol or acetone etc can increasing efficiency of mixed, then having heterocyclic polymerization reaction. The polymer is mainly used for high electrical conductivity polymer coating; Add in organic binder and adhesion agent, such as poly (vinyl acetate (PVA)/epoxy silane, can enhance the adhesion properties. More importantly ,the company has a branch in Shanghai.Shanghai, is one of the world's largest port, convenient for the customes provide logistics services.